I am often asked about how to start a modern dollhouse hobby on a budget. I'm not an expert and so my automatic response is typically "roombox", but I forgot that I once used an IKEA CD cabinet with sliding glass doors as an open plan modern ranch dollhouse. It worked well. It also was quite space efficient since it was mounted up on a wall. 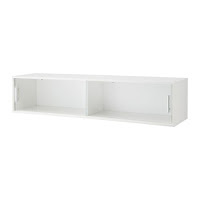 The recollection sent me to the IKEA website where I found two cabinets (pictured above) with sliding doors that would make nice inexpensive modern dollhouses. The first image (my fav) is the Odda wall cabinet for $69.99 and the second image is the Grimle cabinet priced at $99.99. That's a good idea. I may get one this weekend. I wonder if I can take the partitions out. I think you can take the partitions out but to be sure I'd have to see how it is put together. I have found that CD cabinets like these are also great to mount in a closet or entryway to keep children's shoes. I've been reading your blogs and really inpired to get started on this new potential hobby. 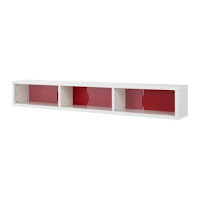 Do you think the Billy wall shelf by IKEA http://www.ikea.com/ca/en/catalog/products/80116676 would also work? Thanks. Maybe you could also take a sample piece of mini furniture to the Ikea to test out on a display before you buy. Shrug. Seriously, I hope you have fun.